OXID eXchange | First-class image optimization - wao.io 1.0 | Stable | CE | 4.1.x - 6.1.x - page | Module, Themes, Language Packs direkt herunterladen! wao.io automatically optimizes your images for the best possible user experience. Our intelligent image optimization algorithm radically reduces file size without suffering a loss in quality. wao.io is a cloud service that integrates like a content delivery network (CDN). Without code changing or additional plugins, wao.io optimizes your website content fully automatically and sustainably. With wao.io you do not have to modify with your running systems. No image uploads, complex API integrations or fragile code changes needed. wao.io will optimize your images on-the-fly, delivering brilliant quality with tremendous data savings. wao.io offers three levels of image compression. wao.io's intuitive dashboard helps you find the right option for your business: simply switch between compression levels and instantly watch the result in your browser. While other optimization techniques process all images with the same arbitrary presets, wao.io uses an intelligent optimization algorithm. Approximating human vision by computing the visual similarity between input and output image, wao.io's algorithm will avoid a visible quality loss. wao.io optimizes your images by converting the original image into the best matching output format that your customer's client is capable of rendering. We support a wide range of lossy, lossless, transparent and opaque image formats for optimization: JPEG, PNG, WebP, GIF. Detailed information on our website. 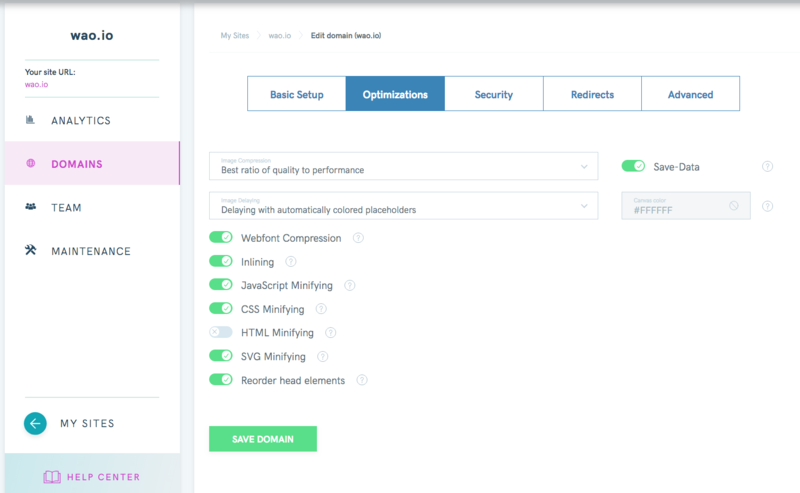 wao.io will automatically and continuously improve your webshop's speed and security.